I know it has been awhile since my last post. 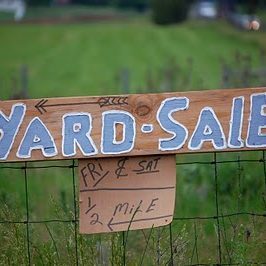 I have been so busy that blogging has been on the back burner for a while. Shame on me! 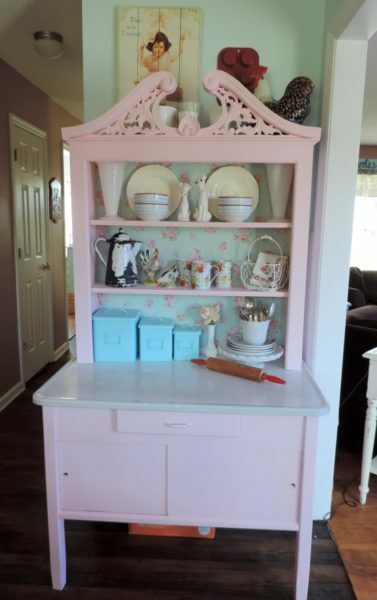 Today I wanted to share with you a furniture makeover project I completed for my kitchen a few months back. I am not sure how many years ago it was but I purchased this really cool vintage Hoosier table at a thrift shop for a mere $20! 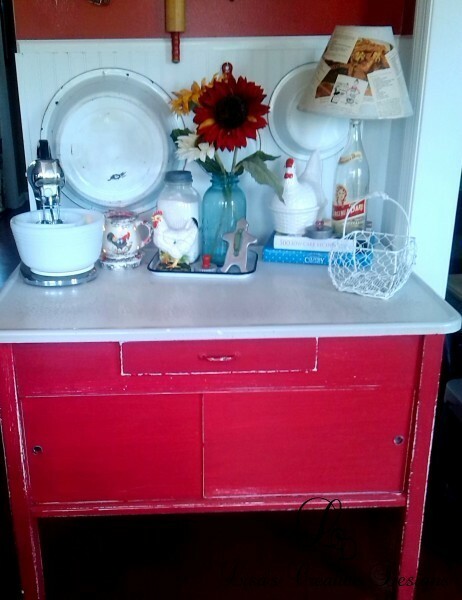 I brought it home and painted the cabinet base of this charming vintage Hoosier table a farmhouse red. As you can see on my walls I was in a RED phase back then. 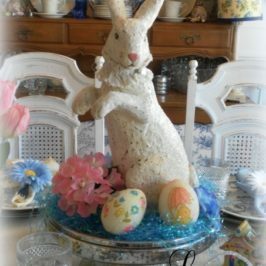 I decorated the table with vintage farmhouse style kitchen decor and there it sat in my breakfast room for a few years. 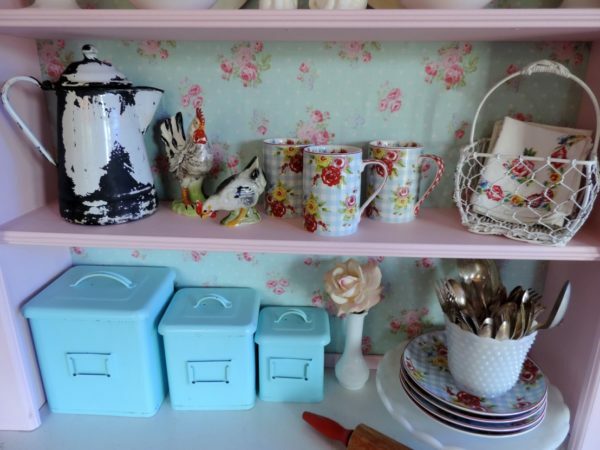 Back then it was all about red and turquoise in my kitchen. 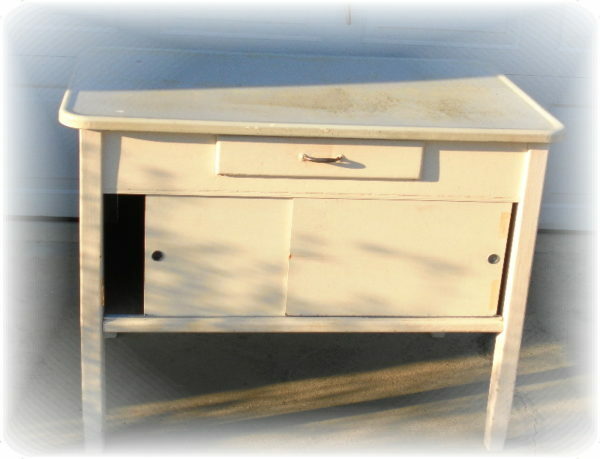 Here is a country hutch that was also sitting in my kitchen. A friend of mine gave it to me. It was already painted a buttery yellow. 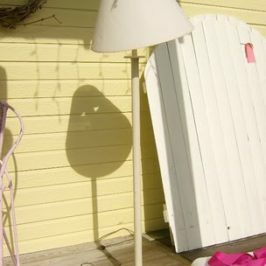 I was not crazy about the color and always meant to repaint it but never got around to it. 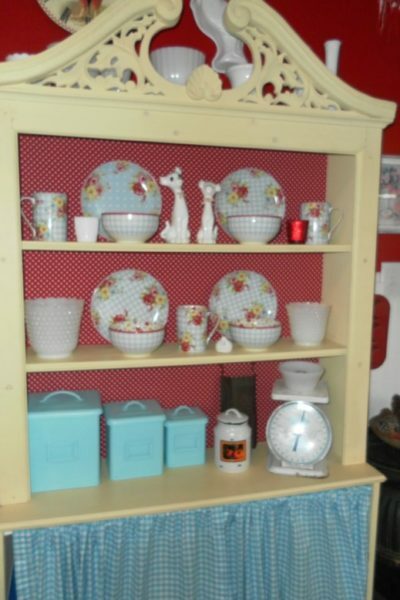 I added red and white polka dotted fabric to the backing and used the hutch to display my favorite cottage dishes. I have always loved the detailed scroll work on this piece. 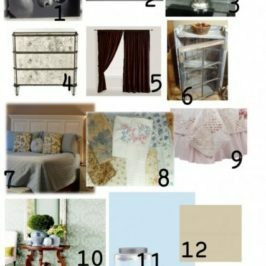 I hung a curtain on the bottom half to hide junk like phone books, envelopes, scented candles and whatever else I could throw in there. Needless to say I grew tired of BOTH of these pieces and my love affair with red had started to fade. 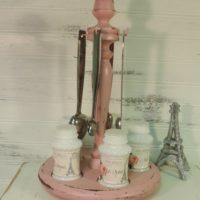 I wanted to give my small cottage inspired kitchen a more open and airy feel by going with a more soft, pastel palette. I painted the walls a soft sky blue and it immediately made the room feel bigger. 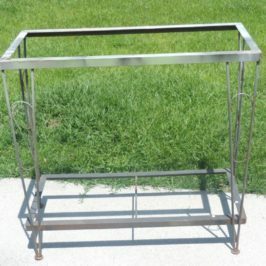 I also wanted to give my Hoosier Table a new look. I decided to dismantle the country hutch and placed the upper half on top of the Hoosier table. I painted the entire piece a petal pink. Yes, that’s right, PINK! 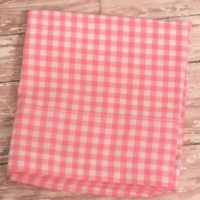 I swapped out the red and white polka dotted backing with a soft floral pink and green fabric I found at Hobby Lobby. 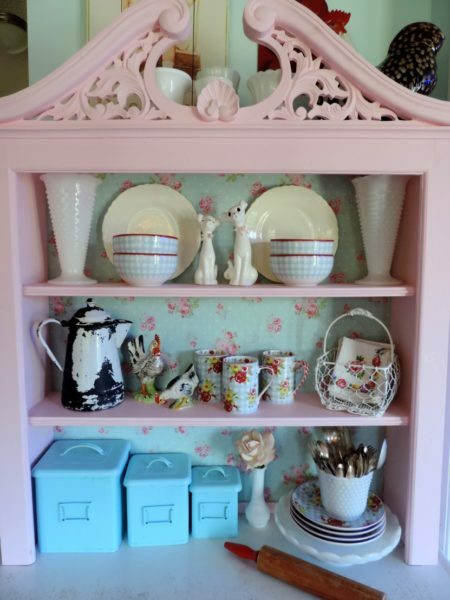 I added my favorite dishes, a few milk glass pieces and a few other collectibles to finish it off. I think it is just darling! 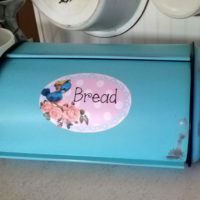 The fabric I used on the backing is the same fabric I used to wrap my generic kitchen trash can in. So, that left me with the bottom half of the hutch. So, what did I do with it??? Storage is always an issue in my house, especially with no basement or attic space. 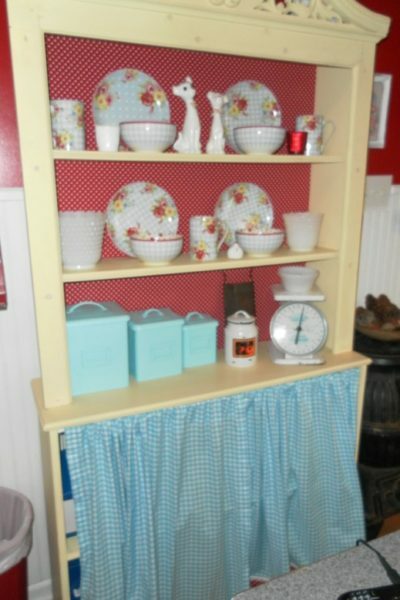 I repainted the bottom half of the hutch a soft light blue and swapped out the gingham curtain with one I made from white Swiss dot fabric. It now sits in front of the window in my dining room. 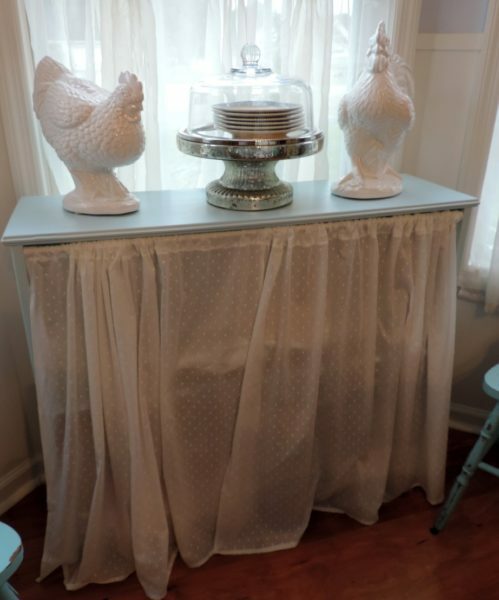 The top is decorated with a rooster and hen set along with my mercury glass cake stand. I have a bunch of fabric stashed behind the curtain as my dining room has to also function as my sewing studio. Another solution to living in a house with limited space. 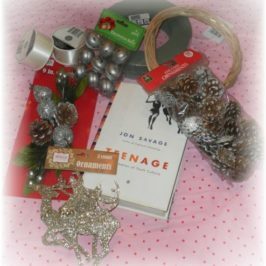 When holidays come around and I have to play hostess I can quickly hide all of my craft supplies and make my dining room ready for guests once again. We are getting ready to replace all the flooring on the first floor. When that task is complete I plan on tweaking my dining room a bit so it is a little more work friendly. I will let you know when that happens. And there you have it folks! 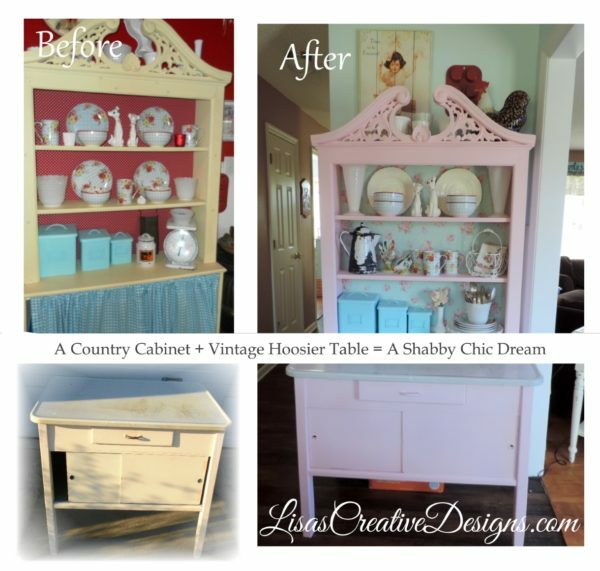 The before and after photo of this Shabby Chic inspired Pink Hoosier Table makeover. I love how it turned out. It is one of my favorite pieces in my home. 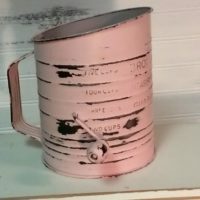 I am happy to say my husband is still a good sport about my love for pink in the house. 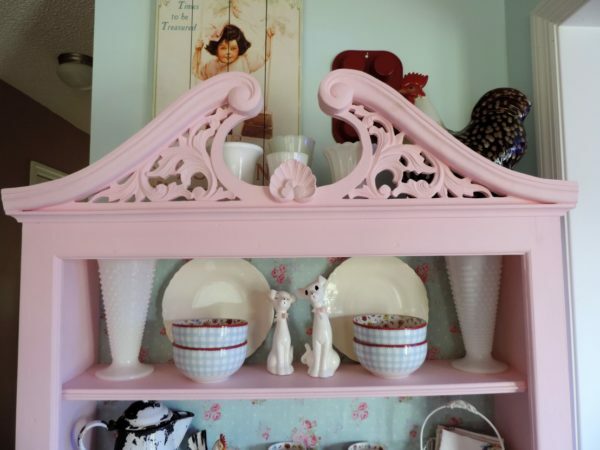 Would you ever consider adding a little pink to your kitchen?